Retail stores are filled with opportunities to increase both the volume of sales and the average order value with the use of the correct retail POS display products. Whether you are trying to neaten up your shelves, create an eye catching shop window display or increase impulse buys at your till, there will be a product available that can assist you with this. All forms of retail have different needs, but whether you’re selling jeans or apples, you will be missing out on sales if your displays, products and offers aren’t clear and professional. Retail stores are filled with chances to maximise sales. I want to try and increase impulse buys around my store or at the till. What is the best product for this type of sale? Impulse buys are usually small low cost items that people can just pick up and throw in their basket without having to really consider the purchase or cost. 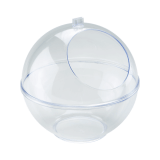 If you have the space at your till, Clear Display Spheres are perfect for this kind of sale. Designed to hold small items such as cosmetics or sweets, the front opening invites people to help themselves, whilst the clear 360 display means your customers can see everything in the Sphere and pick the product they want. If you are looking for something a little more rustic, Wicker Display Baskets are another great option for counter tops and traditional Dump Bins work well on the shop floor. I want to make it clear at a glance that I have an offer on a certain product, how do I achieve this? 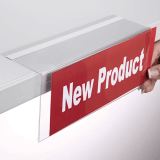 When it comes to making a price or promotion stand out there is no cheaper or easier solution than a Shelf Talker. 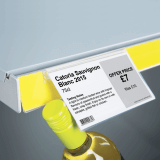 Shelf Talkers can stick or slide on to your shelving dependent on the style of your shelf and can be made in a variety of sizes to display a price, promotion or offer. The print is usually a bright colour to draw the customer into that product instantly. 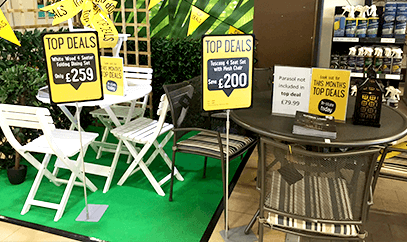 This simple yet effective tool will let your customer know straight away what is on offer, how much it is and where it is as soon as they see your display. If you want something a little larger or more obvious, Aisle Signs and Ceiling Hanging Posters are another alternative that can work really well dependent on the size of your store. I am an independent retailer new to my area, how do I draw new customers into my store? The best way to get people into your store is to let them know why they should go into your store without them having to make the effort to find out. Pavement Signs and A Boards are the easiest way to do this. Pavement Signs can be updated as often as you want, with whatever you want. The double sided design means you can tell people who you are and where you are one side, with your current offers on the other side. An A Board will catch the attention of passing pedestrians and motorists, helping to increase your footfall with minimal effort. There is a style of Pavement Sign to suit every kind of retail including LED Signs, Chalkboard Signs and Water Based Signs. I have a large window area that is currently unused, how do I utilise this? Window Displays are great for enticing people into your shop. An important thing for shops to have displayed in their window is their opening times. Magnetic Window Poster Holders are ideal for this as they are cheap and easily updated. 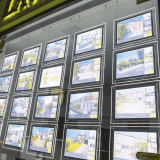 No matter what you are selling, your window needs to reflect your store and business. So if you are a fashion brand, you could get creative with an LED Display Kit. If you are a supermarket, Hanging Posters work well as you can display your products, prices and current offers in your window clearly and professionally. A Hanging Poster is also ideal for advertising a sale in any sector. I don’t have standard shelves for shelf talkers or stickers, what other ways can I display my prices? 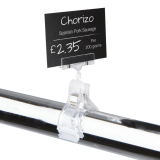 Prices don’t need to be displayed the same way across every kind of retail store – shelf talkers and swing tags work great for supermarkets but not so much for fashion or jewellery. A modern way to display prices and product information is with a Magnetic Photo Block. These are ideal for department stores with stand-alone displays with folded up clothes on, for example. This style allows you to display more than just the price, so you could even include an image and some product spec. 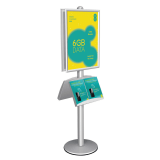 For furniture or other stand-alone products, Wall Mounted Poster Holders or Free Standing Poster Frames are great and again have enough space for product spec and images. Plastic Card Holders work for fruit and veg or individually displayed items. The Clip can grip onto acrylic, baskets, boxes, buckets etc. I have a number of different small items to display in one area, how do I make this look neat and not cluttered? For smaller products, Display Bridges are the perfect solution for creating a tidy, professional and clear display. They are available in a variety of sizes with different amounts of tiers to create an ascending visual for different sized products. If you have one product that you want to create a feature of or one product available in different colours, this style of acrylic stand will do the job and look great in a variety of retail settings.